(186 x 256 mm) 8.3 x 11.7 in. (186 x 256 mm) 11 x 14 in. SMALL 10 x 13.8 in. (255 x 350 mm) 12 x 17.5 in. MEDIUM 14 x 19.3 in. (355 x 491 mm) 17 x 24 in. Prajnaparamita (Tib. Shes-rab phar-phyin), meaning the 'Perfection of Wisdom', is an important female deity who symbolically embodies the perfection (paramita) of the Buddha's transcendental wisdom or discriminating awareness (prajna). From its inception Buddhism has always equated wisdom as a feminine principal or concept, and the term prajna is likewise applied to the consort or female counterpart of any male deity. The earliest versions of the Prajnaparamita Sutras probably date from around the 1st century BC, with their texts varying in length from between three hundred lines, to that of the Mahaprajnaparamita Sutra in a hundred thousand lines. There are also some very abridged sutra texts, which include versions of the famous 'Heart Sutra' and 'Diamond Sutra', and several later tantric versions based upon the concealed-treasure or 'terma' texts that Nagarjuna received from the King of the Naga-serpents. In the Newar Buddhist tradition the goddess Prajnaparamita traditionally represents the aspect of Dharma as one of the 'Three Precious Jewels' of the Buddha, Dharma (his teachings), and Sangha (the spiritual community). The two aspects of Buddha and Sangha are usually represented by the image of Shakyamuni or Amitabha (buddha), and four-armed Avalokiteshvara (sangha). The Buddha traditionally appears at the centre of this trinity; with Avalokiteshvara to the right - representing the male aspect of 'method' or upaya; and Prajnaparamita to the left - representing the female aspect of 'wisdom' or prajna. This monochromatic composition shows four-armed Prajnaparamita seated in vajra-posture upon a white moon disc, an immaculate lotus, and a lion throne. The steps of this throne are decorated with pearl, lotus-petal and scrolling floral motifs, while its main upper step is ornamented with scrolls containing deer and swan motifs. At the centre of her throne's main facade is the emblem of a longevity vase filled with the nectar of immortal wisdom, which is sealed with the flowers, leaves and tendrils of two wish-granting trees. On either side of this emblem are two vertical pillars that show the symmetrical forms of two offering goddesses. These goddesses similarly appear on the outer pillars of her throne's main façade, where two stylized lions stand as guardians. Prajnaparamita is extremely beautiful, as youthful as a sixteen-year-old, and golden-yellow in complexion. She has a sweetly smiling face, full breasts, a narrow waist, a straight back, and her radiant body is endowed with the thirty-two major and eighty minor marks of an enlightened being. Half of her long black hair is piled up into a topknot, whilst the other half hangs freely about her shoulders and back. She wears divine silk garments and the eight jewelled ornaments. Pearl loops hang from her tiara and belt, and her long necklace appears in the form of a chained Newar 'heart ornament'. With her two principal hands held before her heart she makes the 'wheel-turning' dharmachakra-mudra of explaining the Buddhadharma: with her left 'wisdom' hand facing inward to indicate she has fully realized these teachings within herself, and her right 'method' hand facing outward to indicate her ability to skilfully transmit these teachings to others. With her second right hand she holds aloft a rosary, with its equal-sized beads representing her perfect equanimity; while her constant turning of its beads represents her ceaseless vigilance and compassion. 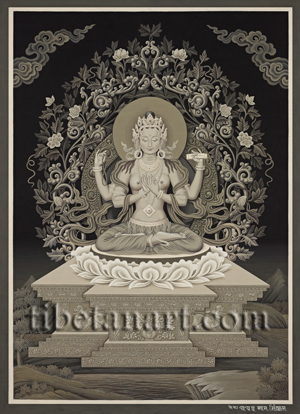 With her second left hand she holds aloft a text on the 'Perfection of Wisdom' (Prajnaparamita-sutra), representing the full maturation of her prajna or discriminating awareness. Her outer aura is composed of the symmetrical frame of two scrolling and jewelled crest-bars, which are entwined by a profusion of climbing lotus stems, leaves, tendrils, flowers and buds. Clouds, mountains, trees, rocks and water appear in the dark background landscape of this lovely sepia painting by Devendra Man Sinkhwal.